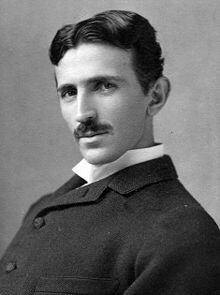 For those not familiar with the name, Tesla was the absolute genius where electricity was concerned. He was the inventor of the alternating current, power system in use all over the world today and his discovery of the rotating magnetic field was almost as revolutionary as the Morse telegraph. He truly electrified the world. In 1884, as a poor Serbian immigrant, he arrived in the United States and although he was poor in terms of money and possessions he was certainly rich in ideas. Ideas that would eventually light up the United States… and indeed the entire world. At this time, the most famous inventor in the world was Thomas Alva Edison, the so-called ‘Wizard of Menlo Park.’ Edison was credited with the invention of the DC dynamo and the electric light bulb, but the only thing he ever really invented was the electric chair. Edison was fixed firmly in the direct current (DC) camp and would not consider any other system at all. DC had very severe limitations and was totally impractical for long distance electrical transmission. Almost immediately after entering the US, Tesla went to work for Edison. Edison was totally unaware of the great benefits of AC until Tesla showed him plans for his induction motor. Edison’s DC system was extremely unwieldy and only worked over very short distances but Edison and his boss JP Morgan (yes, the banksters control technology too,) completely rejected this revolutionary invention. Edison set him to work fixing the many problems with DC dynamos. Tesla had remarkable mechanical and electrical ability, and Edison promised him $50,000 if he could fix a particularly perplexing problem with his dynamo. Tesla worked for many months and finally the problem was solved but Edison reneged on his promise to pay him for all his hard work, resulting in Tesla leaving the Edison Company in anger and disgust. After leaving the Edison Company, Tesla had to work as a manual labourer for a year, ironically digging the streets of New York to lay Edison’s cables. This was the worst time of his life as a poor man in a strange land but he was befriended by the foreman of his work-gang who persuaded him to form his own company. In spite of all the advantages of the AC system, Edison still refused to acknowledge its superiority and eventually inventor George Westinghouse of Pittsburgh came to Tesla’s rescue. At this time, Edison and his boss Morgan sulked like spoilt children and began what became known in history as the War of the Currents or the battles between AC and DC. By 1886, the Westinghouse Company was one of the biggest and most successful in the entire world. Westinghouse was an honourable, highly ethical, Christian gentleman and totally dissimilar to the robber barons of that (or any other) era. His employees shared in the successes of his company and he believed in doing his good works in secret and many charities throughout the country were helped by his generosity. “I will give you one million dollars cash for your alternating current patents, plus royalty,” Westinghouse blurted at the startled Tesla. This tall, suave gentleman, however, gave no outward sign that he had almost been bowled over by surprise. “If you will make the royalty one dollar per horsepower, I will accept the offer.” Tesla replied. “A million cash, a dollar a horsepower royalty?” Westinghouse repeated. “That is acceptable.” said Tesla. Edison’s decision to inflict alternating current upon the world put George Westinghouse and Tesla on a collision course with both Morgan and Edison and no dirty trick was beneath that pair in their attempts to ruin Westinghouse and Tesla. In 1895, the Westinghouse Company and Nicola Tesla built the first hydro-electric alternating current system at Niagara Falls. Tesla was determined that the awesome power of the falls should be harnessed to the awesome power of poly-phase alternating current and without using a single drawing, Tesla was able to work out the whole plan of electrification in his head. Everything worked perfectly the first time, but Tesla was determined to take it one dramatic step further and transmit electricity without cumbersome and unsightly wires. It was also that year Tesla’s laboratory in New York City was very suspiciously, totally destroyed by fire and a lifetime of priceless inventions were destroyed. Tesla usually worked through the night, but that particular night he was not in his office and so miraculously escaped death. By 1897, the War of the Currents between Westinghouse and Edison had continued to escalate. Mergers had taken place between JP Morgan and Rockefeller-controlled companies such as Thomson-Houston and Edison General Electric to form the present day General Electric Company. This new General Electric Company tried to take-over Westinghouse and force them to abandon AC. They also insisted that Westinghouse stop paying royalties to Tesla. By cheating him out of millions in royalty payments, Morgan and Rockefeller placed a financial squeeze on the great inventor. Tesla had already lost a fortune because of the arson to his laboratory and now he was too short of cash to perfect his latest inventions. The arsonists could certainly hamper him financially, but they could never stop the torrent of new inventions that kept-on flowing from his fertile brain. At the beginning of 1900, Tesla was extremely optimistic that he would be able to give the world wireless transmission of electricity and data. Unfortunately, that was not to be the case, Tesla was virtually penniless from losing his royalties on his AC patents and he had to approach his arch enemy JP Morgan for funding. Morgan and his Rothschild backers at the Bank of England realised the deadly military possibilities of using electricity as a weapon and Tesla had already discussed the possibility of using electricity to bring rainfall to the desert areas of the planet. Weather manipulation is the most diabolically clever of all methods of warfare (research HAARP) because no-one can ever prove that the weather is not a natural phenomenon. Meanwhile, Tesla lived at the Waldorf Astoria hotel and commuted daily to his laboratory in Manhattan. The hotel was owned by millionaire John Jacob Astor IV who was also a close friend and financier of Tesla. The Waldorf-Astoria was the tallest hotel in the world and it was the permanent or temporary residence of some of the wealthiest and most eminent citizens of the day. Making his home there became a goal to which Tesla aspired and this he achieved in 1898 and he lived there for the next two decades. In 1899 in Pike’s Peak, Colorado, Tesla demonstrated the feasibility of safely transmitting electricity through the Earth without the use of wires (wireless electricity.) He chose Pike’s Peak because of its remote location and the availability of electricity from a local power station, however he was also to discover that tremendously destructive forces could be unleashed upon the Earth by means of uncontrolled electrical resonance. According to the establishment/bankster-controlled history books, it was Guglielmo Marconi (1874-1937) who discovered radio transmission. However in reality, it was Nikola Tesla’s patents and research that Marconi was using. Marconi was one of JP Morgan’ ‘stable’ of inventors, his company was the British Marconi Company and was financed and controlled totally by Morgan. Marconi was deeply connected with the powerful dark forces of the British establishment, whereas Tesla was a dedicated, down-to-earth, honest and decent man who sincerely wished to benefit all of mankind with his inventions. It was the Marconi Company that gained an exclusive contract, through bribery and insider-trading to set-up the British/bankster Empire’s wireless communication system. Marconi was ‘partnered’ with the British military-industrial complex, and it was during the Boer War of 1899-1901, that radio technology was successfully used commercially for the first time. Many years later of course, radar was developed. It was ‘officially’ invented in 1935, but 18 years previously, Tesla had outlined how it would work. It was he who had originally pitched the idea to the US Navy, who turned it down out of hand. …And who was head of Research and Development for the Navy at the time? Unsurprisingly, none other than one Thomas Alva Edison. The official inventor of X-Rays was the German physicist Wilhelm Rontgen, but it was Tesla who also warned that they were extremely dangerous and who outlined the science years before Rontgen ever did. Who built the first hydro-electric plant? Nikola Tesla. Who was the first person to record radio waves from outer space? All of those were Tesla’s inventions. He also formulated a scheme to provide free electricity for everyone, drawing it from the ionosphere but of course, JP Morgan was not too happy with that idea. Morgan had already developed a great business opportunity in generating electricity, metering and charging for it and as the use of electricity expanded exponentially during the early part of the twentieth century, so did Morgan’s profits. But it was in John Jacob Astor, that Nikola Tesla had found the ideal financial backer and friend. Of course Astor was no saint, he was a hard-headed businessman and had divorced his wife for a girl young enough to be his daughter. But he was not a greedy, treacherous, psychopathic bloodsucker like Morgan, and was working diligently alongside Tesla to bring their ‘free electricity for all’ scheme to early fruition. 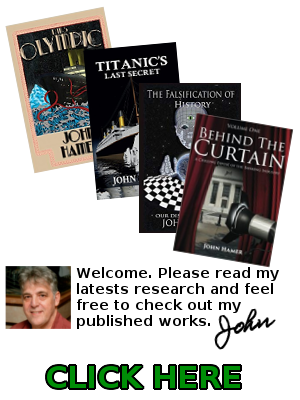 Maybe you can now guess the next part of the story, but there is more than enough compelling evidence to show that RMS Titanic was deliberately sunk by its owner JP Morgan and his Rothschild/bankster friends as part of an elaborate long-term plan that firstly required the eliminating of the main opposition to their central bank takeover of America’s money supply. In addition to that, there was another motive for Morgan, massive insurance fraud. The deaths, or rather murders of more than 1,500 of the ship’s passengers and crew, were all inconsequential to him, except of course for those of Guggenheim, Straus and Astor. Only, where Astor was concerned, there was an additional motive, the elimination of Nikola Tesla’s independent financing and close friendship. Tesla’s revolutionary technological ideas and the possibility of future inventions that would greatly benefit mankind, rather than the banksters’ wallets, were conveniently, literally ‘sunk without trace’ along with the rest of the 46,000 ton ship.